Swami Vivekananda fell on the world like a sword blade after his success in the Parliament of Religion in 1893. He naturally wanted an organization whose work would be at the vanguard of the spiritual wave he had raised. Thus came into being the Ramakrishna Movement. His fiery lectures abroad and his epistles to his acquaintances, inspired people everywhere. In Chennai his admirers started a journal Prabuddha Bharata or Awakened India, this in a short time would become the voice of this new organization, "to bring millions sunk in darkness, to the light of the Lord." In July 1896 the first issue of the journal rolled off the press and this it has been doing uninterruptedly every month for the last 106 years. Throughout Prabuddha Bharata's journey, lack of funds was compensated by an abundance of noble motivation and love for Swamiji. After two years its editor Rajam Iyer passed away suddenly. Swami, then in Almora, resting after his nation awakening tour from Colombo, asked his English disciples, Captain Sevier and his wife to revive the journal. The Captain had a press, type and ink transported from Kolkata. The journal which had missed a number, now was brought out from Thompson house in Almora town, with Swamiji's disciple, Swami Swarupananda as editor. Captain Sevier was in the meanwhile, at the behest of Swamiji, looking for an ideal place, deep in the Himalayas for the Advaita Ashrama. He finally found one in Mayavati in the district of Champawat, 6,400 feet above sea level. The journal with the press followed quickly. This was march 1899. 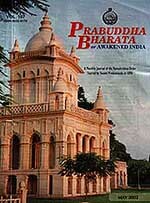 Prabuddha Bharata continued to be regularly published, thanks to the monks and a few local people. It is staggering to imagine them faithfully working in stringent financial conditions, cold, rain, compounded with shortage of paper, ink etc., and carrying materials on horseback from a long distance then despatching the journal at the equally distant post office. In 1914 a separate building was erected nearby exclusively for the journal and the press. As printing technology was improving, it was felt wise to shift the printing to a modern city, which would also help in timely despatch. Thus in 1923 the printing was done in Kolkata, while the editorial section stayed back. Manuscripts were unfailingly sent, despite wars, natural calamities, strikes, etc. This practice has remained unchanged till the present. The greatest role Prabuddha Bharata played was that of publishing the Ramakrishna-Vivekananda and Vedanta literature. Bit by little bit, a vast body of excellent spiritual literature came into being brought out tirelessly by sannyasins of sterling qualities. This literature is now published by Advaita Ashrama, which acts like a beacon light for millions of people the world over. The journal was also a recorder of sorts of the renaissance of Indian monasticism and religion that was now playing an active role in society. While scientific thoughts were smashing superstitions and religious beliefs amazingly, Vedanta philosophy was getting more resurgent by finding newer grounds for its expressions. Prabuddha Bharata brought out the common ground between philosophy and science. This was a direct boon to scores of philosophers, scholars and religious people all over the world. This also opened the door to the study of comparative religions making fanaticism less pronounced. Till now Prabuddha Bharata is just in the initial stage of unfolding itself, for as long as mankind seeks truth, this journal will fulfil the purpose it was meant for. For it derives its sustenance from the infinite world of consciousness, wherein is the source of all blessedness and peace.